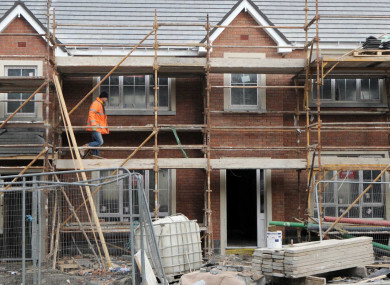 IF IRELAND WAS to significantly increase the number of houses being built, it would see employment levels in the construction industry reaching levels last seen in the run-up to 2007, according to new research from the Economic and Social Research Institute (ESRI). We’d need workers from abroad to build the level of housing Ireland needs but, ironically, the very housing crisis that sees spiralling rents would mean these foreign workers would find it difficult to afford to rent here. Despite the growth in the economy, employment levels in construction compared to those over the past 20 years are still quite low at present but this is set to rise considerably, the ESRI said. However, even though housing supply is low at present, employment in construction is still relatively high which suggests that employment in the sector would have to reach “elevated levels” so that increased housing supply could be provided. So, if housing supply were to increase substantially – which the government has said is a priority – then employment would be approaching levels last seen just prior to the collapse of the economy in 2007/8, according to the ESRI. Within this need to supplement plans to increase housing supply through migration into Ireland, McQuinn highlights a barrier to this happening. “Ironically, the significant increases in rental levels observed of late in the Irish residential market, particularly in Dublin, may act as a disincentive to future inward migration flows,” he said. Therefore, the existing high cost of accommodation may prevent the workers we require to address the housing supply shortage from actually coming to live and work here. In the context where construction employment would have to increase in order to significantly increase the housing stock, the prudent policies are “imperative in preventing the build-up of another domestic credit bubble”, the research concludes. The report can be read on the ESRI website here. Email “For Ireland to build the houses it needs, it'll need foreign workers... but they won't be able to afford the rent”. Feedback on “For Ireland to build the houses it needs, it'll need foreign workers... but they won't be able to afford the rent”.